World Heritage Site faces an uncertain future as human and environmental forces portend a slow demise. 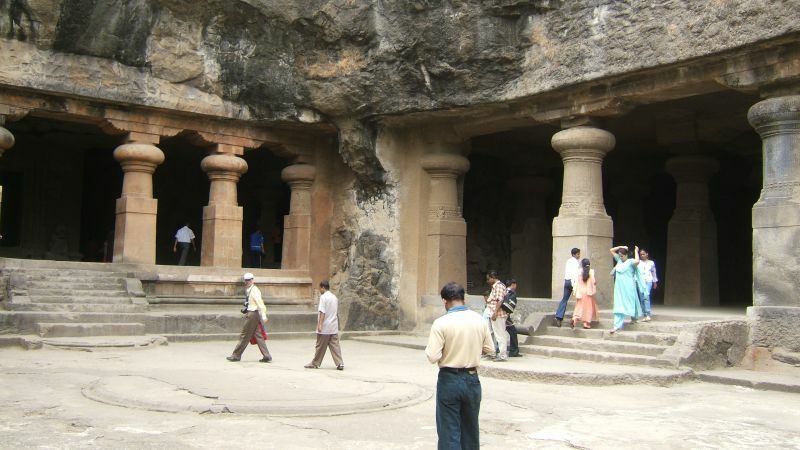 The UNESCO World Heritage Site known as Elephanta Caves dates back between the 4th and 9th centuries AD. 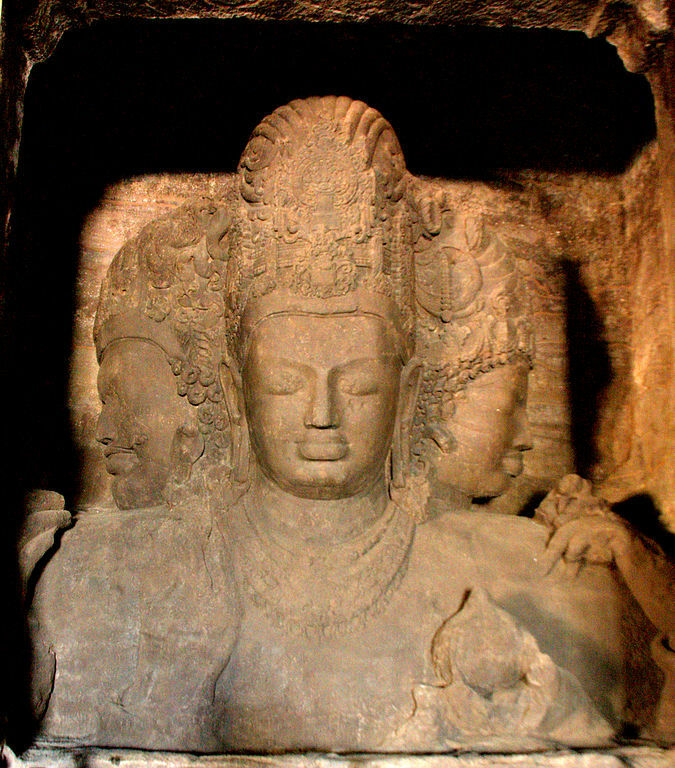 The caves themselves lie about 7 km from the shore of Elephanta Island, originally named Gharapuri/city of caves. The island lies about 11 km north-east of Apollo Bunder in Mumbai, India. Carved out of solid rock, the Elephanta caves feature some of the most impressive statues of Lord Shiva, in his various forms and avatars. Lord Shiva is a major Hindu deity and considered to be the most powerful god in Hinduism. To see this ancient monumental art is, for many, a visual odyssey. Except during the monsoons, the ferries leave from the Gateway of India beginning around 9 am in the morning, transporting thousands of tourists who come to Mumbai to explore the historical site. 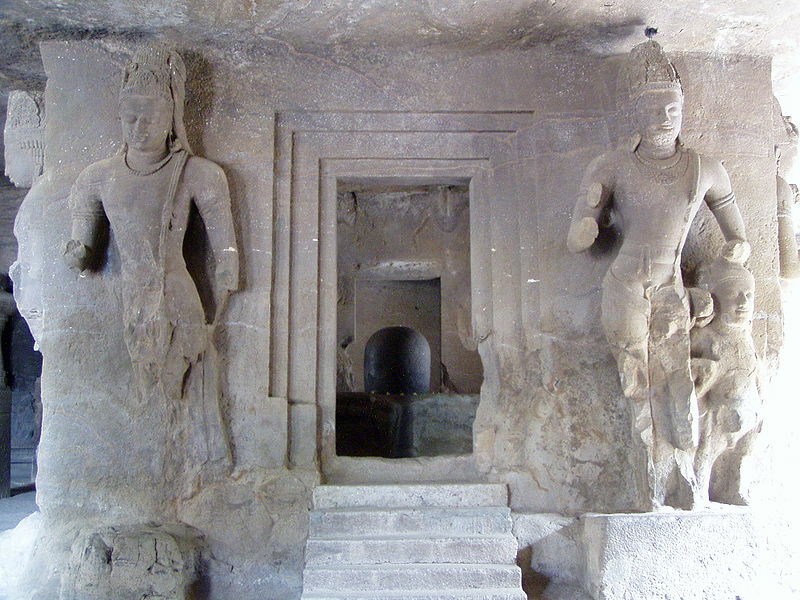 The sculptures in these caves are considered representative of ancient art forms – especially that of the Chalukyan empire and the Gupta kingdom. The three temples stretch out from Stupa Hill to Canon Hill, but it is the temple in the center – the Main Temple – that is grandest of all. It is dedicated to the Hindu god Shiva (the Destroyer in the Hindu Trinity), and showcases Shiva in all his different forms. 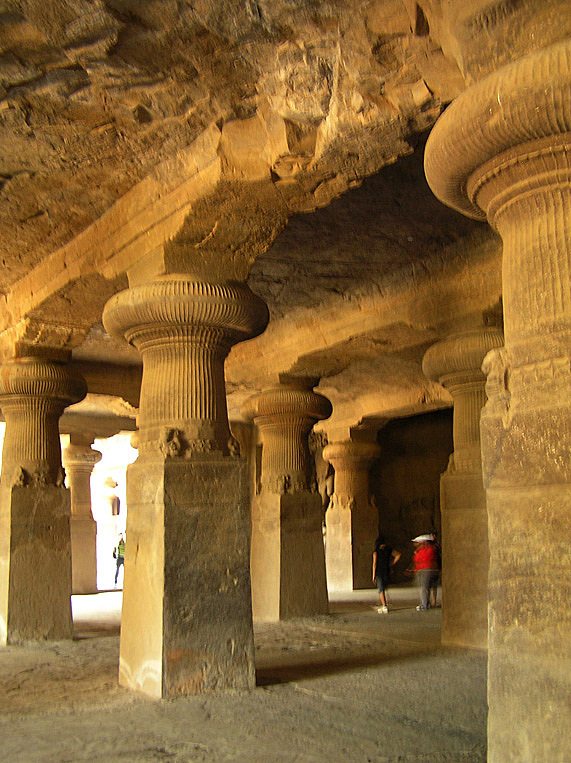 Massive square-sided pillars support a ceiling that is believed to have originally been painted. Opposite the entrance, dominating the wall, is a massive sculpture that depicts Sadashiva, the three faces or embodiments of Shiva. There are other depictions of Shiva, as well – as Nataraj, performing the cosmic dance of destruction; as Yogeshwar, the lord of yoga; as Ardhanareeshwara – half man and half woman and – in his most romantic form – as Kalyanasundara, the bridegroom in his wedding with Parvati. All of the sculptures, including those of the eight dwarapalas (guards of the gate) surrounding the sanctum sanctorum with its shivlinga, have earned the Caves' status as a World Heritage Site. But both historically and today, the Caves face elements that may threaten their very existence. In 1534, Elephanta, along with the islands that were to constitute Bombay, went under Portuguese control. By then sections of the caves were already in ruin, damaged by weather and nature’s forces. It is reported that target practice by soldiers may have also damaged a few sculptures. Later, the Marathas occupied the island in the 17th century. In 1774, the English assumed control of the island. Unchecked destruction within the cave site continued under British rule and it was not until 1909 that the main cave was declared a protected site under the Ancient Monuments Preservation Act. To the right of the main cave, one sees an asbestos sheet fitted in an attempt to ensure the water from the roof of the caves flows into a natural well below. The sheet is installed every monsoon season. The caves are cleaned using chemicals. 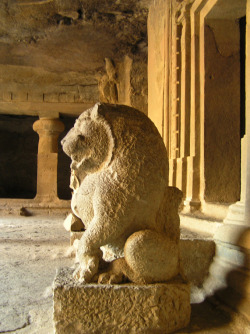 But the defaced head of a lion that stands guard at the lingam shrine in the east court of the main cave is a clear indicator of how the caves are being protected. To its side lies a pool of stagnant water littered with aerated water bottles. Plans and funds for protecting, preserving and developing the site have been limited. The main planning focuses on utilising the grants from the government to install dustbins, create garbage pits, beautify the jetty, build toilets and set up signage across the island. Widespread graffiti and water seepage are issues with which the Archaeological Survey of India (ASI) is struggling to cope. Further, ad-hoc construction has led to mismanagement on the island. Conservationists maintain that the area requires stricter regulations and better utilization of monetary resources. The development and preservation of the site is critical because nearly 90 per cent of the local people in the surrounding communities thrive on Elephanta tourism. Says V. Kanchana, a concerned writer and recent visitor to the site, "the closure of a heritage site such as this is not only unimaginable and beyond reason but would also pose a big economic trouble to the locals of the island and to the image of India’s tourism in general. The caves are too precious and sacred to be lost. As protectors of the world's heritage, archaeologists need government support to protect these historical sites which are in a debilitated state. They can't fight on their own to save the monuments, but we as citizens together can help them in protecting our precious sites so that the future generations are able to get a glimpse of our rich heritage." Elephanta's plight is not limited to its cultural treasures. In addition to being a seat of culture, it is also an ecological treasure, home to myriad species of fauna. Kingfishers, pond herons, plovers, magpies, kites, bulbuls, drongos and minivets, Paradise Flycatchers, rhesus, bonnet and macaque species of monkey as well as numerous butterfly species live on the island and its forests. However, this fragile ecosystem is negatively impacted by industrial developments undertaken by the Jawaharlal Nehru Port Trust, Butcher Island, petrochemical installations, the nuclear plant at Trombay and the Bhabha Atomic Research Centre. Plastic bags outside the caves and tetrapacks floating around the water cistern threatens much of the environment of the island and poses a danger to the survival of the rich and rare species thriving there. Kanchana and others are hoping that new resources and more effective planning and management of already available resources will help save Elephanta from eventual oblivion - If not for the world, at least for the numerous locals who rely on this heritage for survival. For more information about the Elephanta Caves, see the Archaelogical Survey of India -http://asi.nic.in/asi_monu_whs_elephanta.asp and UNESCO - http://whc.unesco.org/en/list/244/.